So you’re working on your physical lab write-up, and looking for the most marks possible. But you just can’t seem to get your head around those pesky errors. Well, this article is a simple guide to the analysis of uncertainties for physical lab experiments, and should ensure that you can get those extra marks. Before I even start to consider uncertainties, my first tip is learn to use both Microsoft Excel and Origin correctly; this makes data analysis, graphing, and more importantly keeping track of, and calculating your errors significantly easier. Personally, I would suggest using Excel for all the data analysis and Origin for graphing and finding the lines of best fit. In the physical labs there are two distinct types of experimental uncertainty you need to be aware of when conducting and analysing experiments. These should be treated discretely, and I’ll discuss each in turn before showing how to bring them together. Imagine that you’ve completed the same experiment a number of times to produce a series of results e.g., an experiment measuring the activation energy of a reaction. You completed the experiment 12 times and found the activation energy values (Ea) shown in Table 1. We can see that no single value is the correct one as they all differ. It’s equally wrong to take the average and quote that alone, because this value is not precisely equal to the ‘real’ average value. So, we must determine the ‘statistical uncertainty’ from this series of experiments. And in finding this, there are 3 important metrics to investigate. The sample mean is the ‘average’ that you’ll be familiar with from high school, and it can be found quickly using the “=AVERAGE()” function, in Microsoft Excel. Here, the values used to calculate the sample mean appear within the brackets. 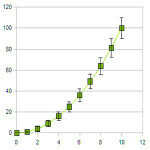 Figure 1 shows how this would look on your spreadsheet. This can be easier to think of as adding all the values together and dividing the total by the total number of values. The easiest way to find the sample standard deviation is to use the “=STDEV.S()” function, in Microsoft Excel. This is significantly more complex to find without the use of spreadsheet software, and is found by dividing the sum of the square of the differences between each value and the sample mean, and taking the square root. Finally, the metric of uncertainty, when considering multiple measurements. The ‘statistical uncertainty’ can be found using a calculator, as it is simply the sample standard deviation divided by the square root of the total number of values (what you divided by to get the sample mean). This is the ‘uncertainty’ that’s quoted with the sample mean, and is the uncertainty that should be propagated through the equation (see Propagation of Errors below). 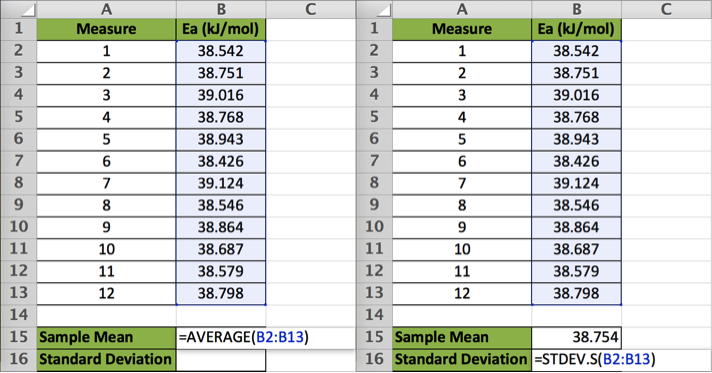 If you want to try these calculations out for yourself, the sample mean, sample standard deviation and statistical uncertainty for the Ea data are shown here. This ‘uncertainty’ arises from the limited precision of the output display on the measuring ‘instrument/tool/apparatus’. 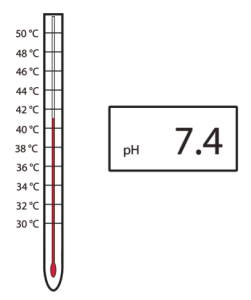 For example, this might be an alcohol thermometer where the scale shows measurements in increments of 2 °C, or the electronic display on a pH meter which shows pH values only to the first decimal place (both examples are shown in Figure 2). 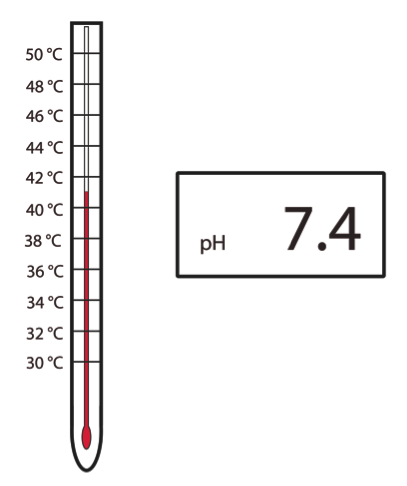 Using the example of the pH meter; from the reading (pH = 7.4), all that can be stated with any precision is that the solution pH is somewhere between 7.35 and 7.45. At pH < 7.35, the reading is rounded down to 7.3, and at pH >= 7.45, the reading rounds up to 7.5. This means that the uncertainty associated with this single measurement would be ± 0.05, which is one half of the smallest interval that can be measured. This rule holds true for the uncertainty of any individual measurement. In the example of the alcohol thermometer, the uncertainty would be ± 1 °C as the interval of measurement is 2 °C. So, for any measurement made, it’s important to note down the uncertainty associated with it. Now that we have a grasp of these two types of errors, we must consider how to deal with these, and how they affect further analyses. Figure 2. Two examples of display methods for which an uncertainty should be accounted for. Often, an arithmetic operation must be performed on a measured value in order to obtain some other useful value. For example, a car moving over a 100 ± 0.5 m track (the uncertainty in the distance is ‘half the smallest interval in the surveyor’s wheel’), at a speed of 25 ± 1.1 m/s (this uncertainty is the statistical uncertainty of 4 speed measurements made throughout the 100 m track as shown). However, it is also important to consider how the uncertainty in the measurement of both distance and velocity affects the uncertainty of time. This is called the ‘propagation of errors’. To find how the uncertainty of a measurement propagates through an equation we must take the derivative of the calculated value with respect to the measured value (if you are struggling with first-order derivatives try using a website such as //www.derivative-calculator.net). Here we can see that a ‘small change in distance’ (the uncertainty in distance), divided by the constant velocity, v will result in the ‘small change in time’, (or the uncertainty in time with respect to distance). So, the uncertainty in the velocity, multiplied by the distance, and divided by the velocity squared, will give the effect of the velocity uncertainty on the time uncertainty. The minus sign can be essentially ignored; as uncertainties are always plus-or-minus the uncertainty should be treated as an absolute value, e.g. magnitude. Now we have the effect of the distance and the velocity on the time uncertainty, but how should we bring these together to give the overall time uncertainty? The same formula can also be used to bring together an uncertainty from a single measurement, as well as from many measurements. For example, you measure the pH of a solution 4 times and find it to be 7.4 ± 0.1. However, the single measurement uncertainty is 0.05, which also must be accounted for. So the total ‘uncertainty’ is found with Equation 6, by adding the square of the statistical uncertainty with the square of the single measurement uncertainty. This total uncertainty will often be very similar to one of the other uncertainties that make it up, but it’s an important step nonetheless, both for thoroughness and to ensure you consider the different uncertainties equally. So that’s a brief run through of the types of error analysis that should be applied to undergraduate physical labs. It may seem like a lot of work for a few marks, but once you have a good grasp of error analysis, it can be very quick and straightforward. I hope this article has been helpful, and if you have any questions about your coursework, why not pop along to the ChemPALS meetings on Wednesdays, Rm 69 Joseph Black Building at 13:00 where Andrew will be more than happy to help. Your opinion is very important to us. Please let us know if this article has been helpful by liking or sharing. Thanks. Recent MChem graduate who moved south to pursue a PhD.